Analytics Vidhya is on a mission – to create next generation of data scientists in India. Over the last 4 years, we have helped millions of people learn data science. We have enabled career transitions and we have seen our community members go through a transformation in their data science journey. I am pretty sure this is just the start – a signal of things to come. I feel fortunate to be able to create a change at this scale! Today, I am excited to announce our largest initiative in this direction – DataHack Summit 2017. If you follow us, you would have already seen some details about DataHack Summit. But, let me present our perspective. DataHack Summit (DHS) is a conference aimed towards data science practitioners. It is a conference which celebrates the awesome work being done by data scientists across the globe and showcases it to the rest of the community. 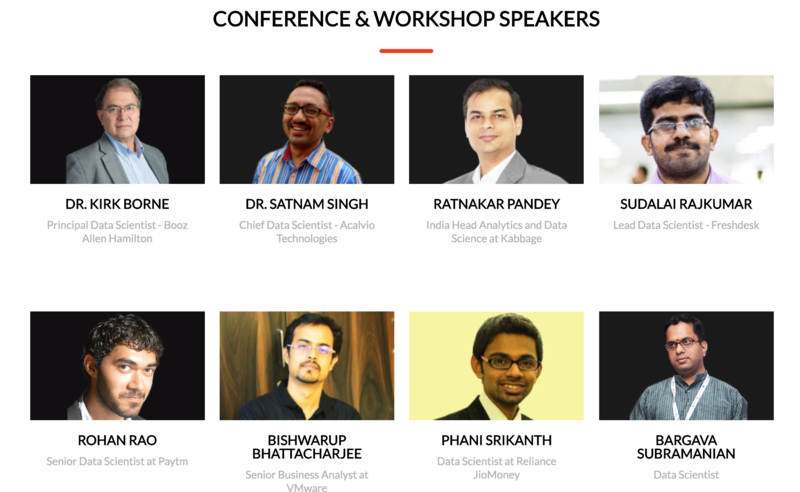 It is a conference where we talk data science, we breathe data science and we experience data science like never before. DataHack Summit is a festival for those who don’t see numbers as just numbers. It is a festival for those who see numbers as designs and patterns and trends, those who see and appreciate this art of dealing with data. DHS 2017 aims to show the bleeding edge, the horizon and the impact of data science to the professionals who perform it every day. It aims to inspire you with the new tools, techniques and applications by bringing the best in data science together. We at Analytics Vidhya feel passionately about enhancing data science culture in India. We want people to talk, showcase and learn data science. However, most of the events we have attended in past tend to leave you high and dry. People talk about benefits of data science from a high level and leave out the details. We haven’t seen people talk about the real challenges faced while solving data problems. For the last few years, we have never walked out of a conference in India feeling satisfied from the learning from the event. DataHack Summit aims to change this. We aim to create a conference where people take pride in talking about the intricacies in data science. We aim to create a conference which leaves you in company of several like minded passionate people. We aim to create a event where data science evolves in India. What can you expect from DataHack Summit? Some of the best data science thought leaders and influencers from across the globe. 3 days of undiluted fun with data, numbers and the best minds in the profession. Dr. Kirk Borne has graciously accepted to be a Keynote speaker for the event. Every speaker is a practicing Data Scientist and comes with tremendous experience in the domain. We will put all our experience in creating top quality content with these world class speakers to make these talks awesome. In addition to the talks and workshops, we will have a fun filled evening. More details to come out soon. The early bird tickets are available till 7th August 2017. Make sure you buy your tickets before the early bird goes away! You will only regret missing it later. Hope this preview gets you as excited as we are about DataHack Summit 2017. If you have any thoughts / suggestions / questions, happy to take them here. Looking forward to see you in Bangalore. 10 Advanced Deep Learning Architectures Data Scientists Should Know! I am missing this opportunity. Can I get recordings for this event. Appreciate confirmation on the same.